In 2012, Tarrell Robinson was approached with an opportunity to lead his alma mater, North Carolina A&T State University. While both playing and serving as an Assistant Coach there, he made a positive impression on the person who would eventually hire him. 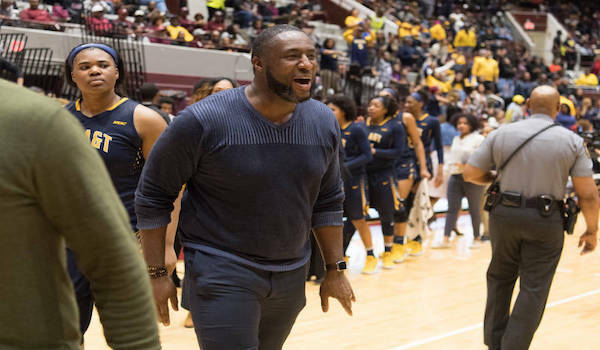 The move has worked out for all sides as Robinson has led North Carolina A&T to a 142-78 (.645) overall and 89-23 (.795) MEAC record, three MEAC Regular Season Championships, two MEAC Tournament Championships, and five post-season berths (two NCAA Tournaments). Can you take us through the process up until and your emotion once you were officially named the new Head Coach at NC A&T back in 2012? Well, I was kind of in limbo after my boss at VCU, Beth Cunningham, decided to go back to her alma mater, Notre Dame, and win a National Championship. I was trying to figure what my next move was and in that process I was approached by a few different DI mind-major and Power 5 Head Coaches about joining their staff. I had narrowed my decision down to two Power 5 schools when I received a phone call from my current Athletic Director, Earl Hilton. He asked if I’d be interested in the opportunity that had just recently opened up at North Carolina A&T State University my alma mater. Mr. Hilton and I go back to my time as a player at NC A&T. He worked in compliance at the time and would always compliment me on how hard I worked as a student-athlete on the men’s basketball team. I told him that I was interested and I needed the process to move quick because I was getting ready to decide between two other opportunities. He asked me to meet him a couple of days later and when we did, he asked “do you want to be a Division I Head Coach at your alma mater?.” I immediately said “yes”. Then he asked me what I needed to be successful. I told him a recruiting budget, summer school for our athletes, and scouting equipment/program. He said, “done”, and the rest is history. What advantages have there been coaching at your alma mater? My unwavering passion and belief in the product I am selling, which is a quality education from the number one HBCU in the country and a basketball experience you will always cherish on one of the best and winningest mid-major programs in the country. When I speak about things it comes from experience. I was a student-athlete here and I think I turned out pretty well, so it’s hard for me to think that you wouldn’t be able to create your success here. What have been some of the keys to your program maintaining a high level of success over the past seven years, competing for conference championships each year? My staff has been instrumental. Having the chemistry we have with each other and a mutual desire to make what we are a part of something special. We all share that common goal. My staff has been with me my entire time here and I think that in itself says a lot about them. What are some areas of being a Head Coach that can be time consuming, but not necessarily something that an aspiring Head Coach may not prepare for? Two things. First, you have to spend one on one time with your players. You have to get to know them if they’ll let you. Secondly, you have to be able to relate to everyone’s situation even if it’s not something you value or think is important. No one likes a person who thinks they have all the answers, even in leadership. Everyone’s maturation process isn’t the same. Some things take time and you have to know when they need to be given that time as a leader. Patience is truly a virtue in my opinion.